This bold Victorian reproduction gas wall light fits well as accent lighting for your dining room, bath or anywhere you want to make a statement. 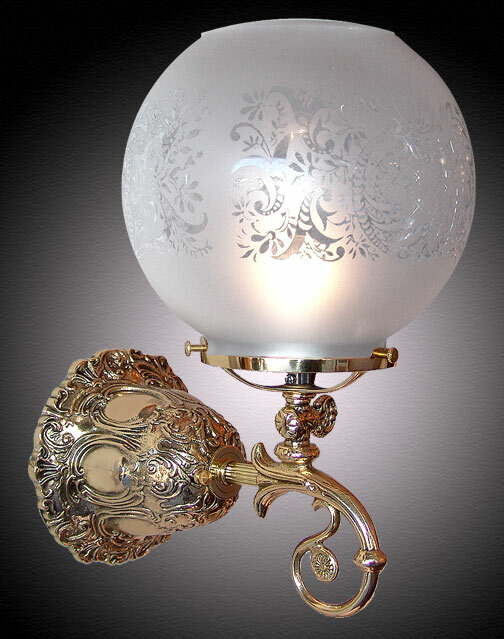 All solid cast brass construction, including this very ornate heavy cast back plate with handblown French acid etched glass globe. Can be mounted with glass facing up or down during installation. Free mounting hardware included. Width 8 In. / Projection 10 In. / Depth 12 In.